Top 10 panoramic views of Paris: it is always exciting to discover a city from above… and Paris makes no exception with its world-famous monuments and landmarks. Here is a list of our 10 favourite panoramic views of Paris. The third platform of the Eiffel Tower has one of the best views over Paris, stretching for 70 km, as far as the outskirts of the French capital, Charles de Gaulle airport and the countryside beyond its suburbs. If your aim is to admire Paris itself, it is better to come down to the second platform, from where everything will look closer and you will be able to see the city’s most famous monuments in detail. Although being the highest viewing point of France, the Eiffel Tower is too far west for a really good panorama and many think that the platform of Tour Montparnasse is a much better choice. Although not quite as high as terraces of other monuments, the free-platform of department store Printemps on Boulevard Haussmann gives a fine view over the roofs of Paris, particularly those of Haussmannian buildings. There is a good perspective leading to the Madeleine Church and the Eiffel Tower in the background. At 69 metres high, the South tower of Notre-Dame offers magnificent view over West Paris (from the Eiffel Tower to La Défense and Sacré Cœur). You should stay as long as the guards will let you in order to fully appreciate the moment. This extraordinary view also provides a different perspective of the cathedral’s greenish roof, as well as the clocks and the gargoyles. The view of the Paris skyline from the top of the Montmartre Hill is one of the most reputed of the capital. Fewer people know that it is possible to enjoy a much better view by climbing to the dome of the Sacré-Cœur Basilica. The vista from the external gallery is breathtaking and extends for over 30 km on a clear day. This is our favourite view over Paris! The 56th floor of Tour Montparnasse is ideally located to discover all of Paris: the Eiffel Tower, the Louvre, Montmartre and the Luxembourg Garden appear under new perspectives. The open-air roof-terrace is opened to the public and is best for taking photos of Paris’ most famous monuments and landmarks. The panoramic view from the platform of Arc de Triomphe is amazing as it displays the twelve avenues departing from the Place de l’Étoile. The viewing platform also offers a fine view over the whole Historical Axis, from the Louvre to the Grande Arche in the CBD of La Défense. The best time of the day to appreciate the fine view is to go up at dusk on a sunny day when most of Paris will then be illuminated with the light of the setting sun. Visitors can either use the lift or climb the 284 steps to reach the panoramic platform. Our favourite time to visit the platform of the Arc de Triomphe is at night time in December when the Champs-Élysées are lit with Christmas decorations and lights! A rival of the Printemps department store, the panoramic terrace of Galeries Lafayette is worth to discover with its fine view of the Grands Boulevards district, Notre-Dame and Panthéon. The surprising mass of the Opera Garnier is remarkable. The Mont Valérien is a hill culminating at 162 m above sea-level in the western suburbs of Suresnes. From the grand terrace at the foot of the fortress, the view stretches from the skyscrapers of La Défense to the Eiffel Tower, Montparnasse Tower and the Panthéon. The whole Bois de Boulogne can clearly be seen at the bottom of the hill. The Park of Saint-Cloud offers many view points overlooking Paris. The terrace at the location of the former palace soars some 100 metres above the Paris skyline, from the skyscrapers of La Défense to the hill of Montmartre, the Eiffel Tower and Montparnasse Tower. The Parc de Belleville in the 20th arrondissement of Paris, is situated between the Parc des Buttes-Chaumont and the Père Lachaise Cemetery. It was inaugurated in 1988 on the slopes of the hill of Belleville which reaches an altitude of 108 metres above sea-level, making it the highest park in the French capital. 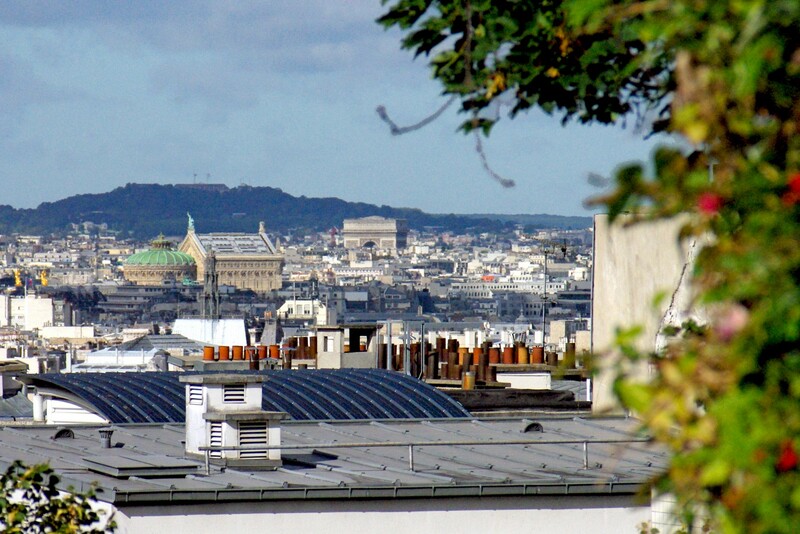 The view over the roofs of Paris is a fantastic one to be admired best under the morning sun. Next Article Happy Mother’s Day to all the mums of France!